Estermann GmbH is winning new short-run work and is now able to meet its customers' growing demands for print personalisation thanks to its investment in Fujifilm's Jet Press 720S. A one-stop, full-service print business with a proud 30-year heritage, Estermann GmbH employs more than 80 people at its premises in Weierfing, Upper-Austria, conveniently located between the region's two major metropolitan centres, Munich and Vienna. Serving a huge range of customers in 22 countries around the world, the company offers LE UV offset printing, digital finishing, and design and prototyping, and combines expertise with ingenuity to delivery stunning print work for its demanding customer base. Its Jet Press 720S investment in October 2017 has helped it to broaden its product offering and improve its customer service still further, enabling it to offer an expanded range of high-quality, short-run work as well as high quantity variable data print. "We work as a service partner for industrial and creative customers who want to draw attention to their products through high-quality, specialised print media," explains Michael Wachter, joint Managing Director of the company alongside Peter Estermann. "From production to shipping, we make sure we use the very best materials and technology to deliver the best products and service possible. In our industry, it's important to provide highly competent consultancy services and solution-orientated customer service, as well as using the most innovative technology for the creative development of new products." 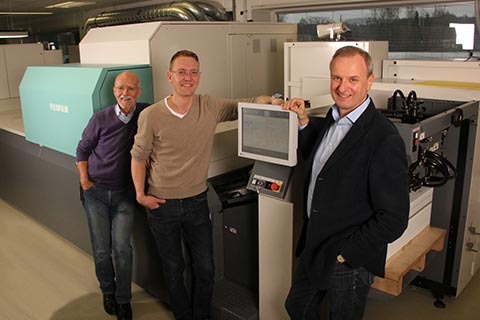 Peter Estermann and Michael Wachter first encountered Fujifilm's powerful, second generation B2 inkjet press in the spring of 2017, and it made an immediate impression. "The quality and reliability of the machine were hugely impressive," says Wachter and we were also impressed with the knowledge and expertise of Fujifilm's technicians, and Fujifilm salesman Frank Goedicke. In fact, the attentiveness and helpfulness of Fujifilm staff was as much a reason for the investment as the qualities of the machine itself. Throughout the installation and set-up stages they were fantastic to work with - and they continue to provide invaluable help in getting the very best out of the machine. We're using it to produce high-end mailings, personalised print products, folding carton packaging, folders, books, brochures and high-quality samples for our long-run offset work." "Our customers have been thoroughly impressed with the quality the Jet Press can deliver and our investment has given us the confidence that we are in the best possible position to capitalise on the growing demand for personalisation, high-quality prototypes and samples and precise colour consistency. I would have no hesitation in recommending the Jet Press 720S, both for its quality and for its reliability." Says Taro Aoki, Head of Digital Press Solutions, Fujifilm Graphic Systems Europe "The future of print lies in short-run, value-added work that can be turned around quickly. With its unmatched quality and excellent levels of up-time, the Jet Press 720S is the perfect machine to help print businesses stay ahead of the demands modern print buyers are making of them. Estermann has learned this for itself first hand, as have more than a hundred other print businesses around the world that have realised what a Jet Press 720S can do for their businesses. We're delighted to see the positive impact the Jet Press 720S is already having on Estermann's business and we look forward to helping them to continue to build on this early success."